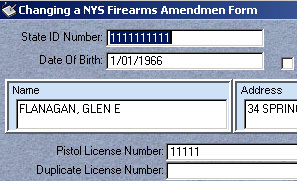 Gun KeeperTM is a complete management system for the creation, issuing and tracking of firearm permits and registrations. 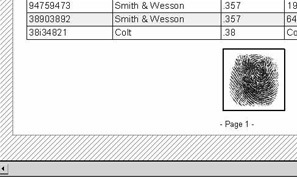 Agencies issuing gun permits and registrations can benefit from cost savings and the image enhancement provided by secure plastic card permits. The software provides flexibility by linking a card layout to one or more categories of cardholders. 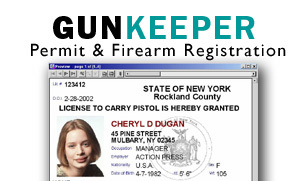 Gun Keeper utilizes MS Access database. Links to other client ODBC databases (Oracle, DB2, MS SQL, etc.) are available. 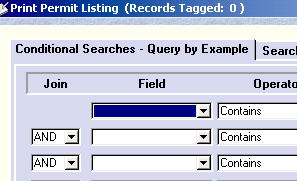 Custom data fields are easily added. Card layout design is enhanced with easy to use drag and drop methodology. Design your cards & forms to include photos, signature, fingerprints, graphics, fixed and variable text fields. Please contact us by e-mail to learn more about Gun Keeper or call 1-800-742-2273 to speak directly to a PlastiCard consultant.